Pointies! | Curses! Foiled Again! All posts in category Pointies! Going along with everyone else, here’s my contribution to Og’s latest meme. This is the knife I carry every day*, and the one I usually go to first (click to embiggenate). 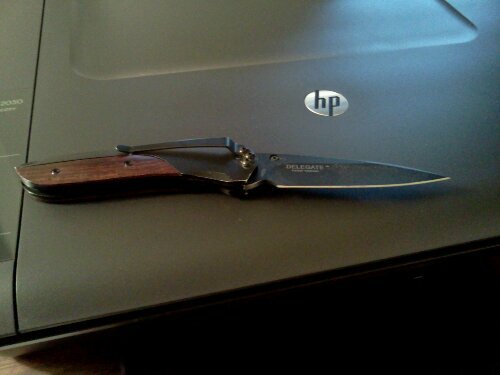 That’s a CRKT Delegate that I bought back in December. I chose it because it’s an assisted-opening knife with an easy** to use safety, and it’s both classy enough for my office job and practical enough formy volunteer EMS work and for everyday use. The pocket clip is nice and tight yet still easy to clip on, and the assisted-opening action is nice and crisp. The blade came almost razor-sharp, and is holding the edge very well. It lists on CRKT’s site at $59.99, but I got it from knifecenter.com for about $40. The only issue I have with it is that way the safety is designed makes it almost impossible to open the knife with my left hand – my previous EDC knife was ambidextrous, but had no safety and would occasionally open in my pocket, and I decided a safety was necessary after a couple of close calls with the edge – but the position means it’s quick and easy to open with only my right hand. Every other safety I’ve seen is positioned so that it’s difficult to use one handed and quickly, which went against one of my main requirements. * I do usually have a second knife somewhere on me, or nearby, but I rarely use it for cutting. For work, it’s a cheap penknife that does a kind of flip-fold thing to open and doesn’t really have much of an edge (it was free) but is okay for cutting tape or opening envelopes. That generally lives in a small inside pocket of my jacket. For everyday carry and EMS work, I have an old Leatherman that was a gift from Dad’s boss at the time. The two blades on that are extremely sharp, but inconvenient to open. I use the tools more often than the blades. ** “Easy” in that it’s simple and well positioned for one-handed unlocking and opening. The mechanism was very stiff when it was new, and even though it has loosened up some with use, it’s still fairly stiff and requires a good amount of pressure to use. Q: Chuck Norris meets a Gurkha who has been ordered to bring him in “dead or alive.” Who wins? A: Chuck Norris surrenders, because he knows he’s outmatched. Posted in Cowards, Crime, Evil Bastards, Heroes, Humor, Lethal Force, Pointies! Sharp, pointy joy. Specifically, the knife I said I ordered in this post. 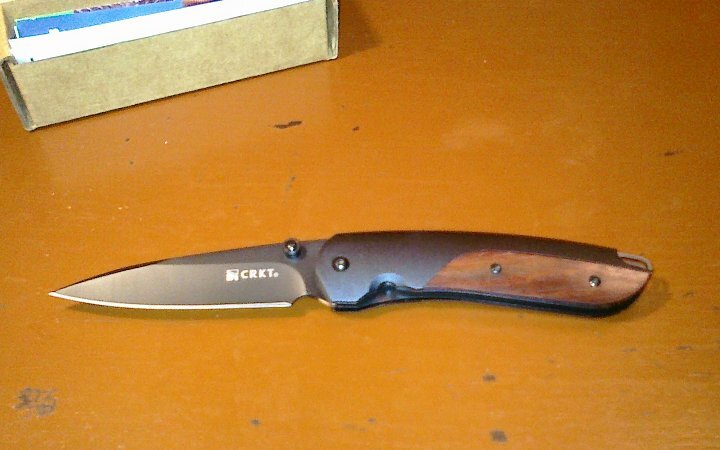 It uses CRKT’s Outburst assisted-opening mechanism and FireSafe safety lock (video). It opens quickly and easily with one hand, but won’t open accidentally in my pocket – something that has happened to me on occasion with my other assisted-opening knife. It has a very solid “snap” when it opens, and there’s no question that it has locked open. The edge is nice and sharp right out of the box. It’s brand new, so the mechanisms are still a little stiff, but I expect that to change as it gets used. My ordering experience was excellent. As I noted in the earlier post (linked to above), I ordered from Knifecenter.com. When I ordered, I knew there might be a bit of a delay, since the website listed it as “Usually ships within a week”. The same day I ordered (late Friday afternoon) I got an email explaining that they would check their inventory by the next business day and email me with the expected shipping date. On Monday, I got an email saying it would ship “within 5-7 business days.” Again, not unexpected, and I was glad that they were keeping me up to date. Late Tuesday, I got a pleasant surprise: an email letting me know it had shipped, and a UPS tracking number. Of course, I immediately checked it and it just said UPS had received the shipping information. This morning, I checked again expecting to see an expected delivery date of Friday or Monday. Instead, it said the package was “out for delivery”! When I got home after work, it was waiting on my front step. This was one of the best online ordering experiences I’ve ever had. I would gladly recommend Knifecenter.com for anyone. And, of course, I have a nice, new, elegant looking knife to wear at work and for daily carry! If you run an internet based store, it is generally good practice to show that an item on your site is not available because it “hasn’t been released yet.” That way, when I order it I know it’s a pre-order. Of course, they couldn’t give me any indication of when it would be available. The alternative they suggested was the Delegate EDC with white bone scales. 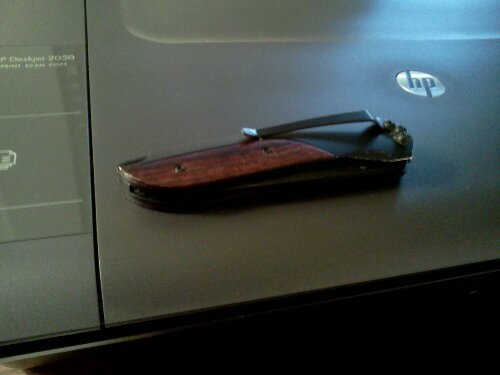 I would prefer the Delegate EDC with cocobolo scales, and indicated that in my reply. The response? Of course, their website did not indicate that, either. At this point I told them to cancel, and specifically told them I would instead order from someone who does indicate that they don’t actually have the product yet. I’m just a little bit peeved about it. Update: I ended up ordering from Knifecenter.com, which specifically notes an item’s availability as part of the item information right at the top of the page. I also ended up getting the Delegate EDC with cocobolo handles – after some reflection, I realized the EDC’s drop-point blade probably meets my usual needs better than the clip-point style of the Gentleman. It’s availability is currently listed as “Usually ships within a week” rather than “In stock”, but because they put that on the item page I knew that when I ordered it!